Smart technology has drastically altered how we operate in everyday life, and the workplace is no exception. These technological advancements have contributed significantly to how businesses operate both in the big picture and in day-to-day activities. With smart technology evolving at such a fast pace, what’s in store for the workplace of the future? Whether you're excited about these new possibilities, or apprehensive about how they will affect you, the workplace of the future is being shaped right before our eyes. It’s important to be aware of these advancements and how they will affect the overall business climate. Top economic expert Geoff Colvin argues that humans are underrated. Learn the high-level skills you need to master to stay ahead in this business climate. What many people don’t realize is that the futuristic-style workplace often depicted in sci-fi movies is much closer to becoming a reality than we realize. 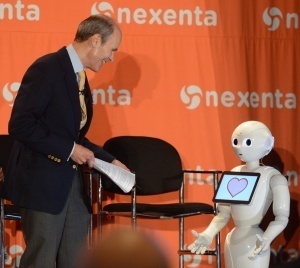 Take the photo below, for example, of Geoff Colvin, Fortune magazine senior editor-at-large, interacting with Pepper, a workplace robot designed to help meet business objectives. These advancements seem straight out of the future - except they’re happening right now. As revolutionary as it is to have robots at work, it also creates uneasiness in the workforce. How will we adapt? Is it possible to outperform these advanced systems?How will leaders manage the external forces of this disruptive change in their organizations? 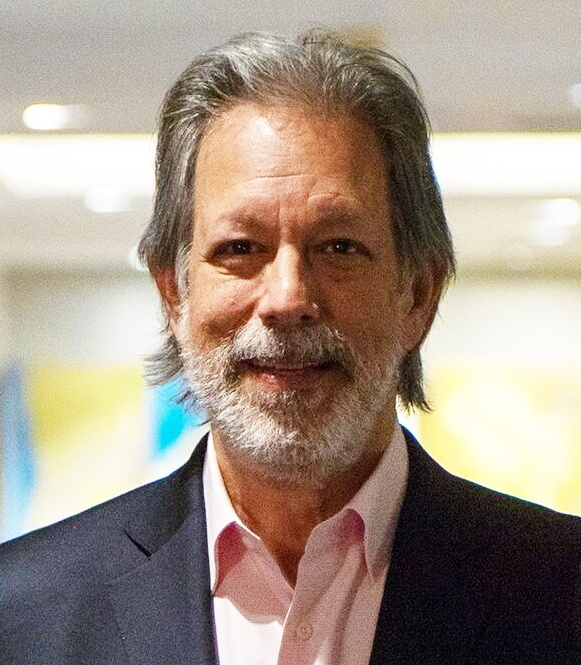 In a speaking event in July, Geoff Colvin startled a group of bankers when he spoke about Kensho, software that analyzes data in complicated government reports – the monthly jobs report, for instance. That report comes out at 8:30:00 on the first Friday of every month. Kensho dissects the data in a fraction of a second and delivers it to subscribers in useful format at 8:30:05 -- just 5 seconds after the report goes public. Kensho data is then used by decision-makers to instantly act on the information for investing, etc. This is sobering news for anyone in the financial services world. They’re not alone. Other industries are encountering similar disruption. Colvin spends his time writing and speaking for audiences in industries feeling disrupted (and who isn’t?!). He offers a glimpse into the future and provides insights to help them adapt and succeed in the uncertainty that lies ahead. WHAT'S STILL TO COME FOR THE FUTURE? Any conversation about the workplace of the future inevitably focuses on robots and sophisticated smart technology that are encroaching on work previously done by people. It’s happening in every phase of work, it seems. And machines are doing the work faster, cheaper and better than people. It begs the question: what is the future of the workplace? What will people do to earn a living? How will humans add value? These are the questions that GEOFF COLVIN, senior editor-at-large at Fortune magazine sought to understand with the research and writing of his book, Humans are Underrated: What High Achievers Know That Brilliant Machines Never Will. For further insight into how the landscape will shape the future, I sat down and asked Geoff more about the future of work and the workplace. HOW IS OUR THINKING ABOUT COMPUTERS AND THE FUTURE OF THE WORKPLACE FLAWED? WHY DO YOU THINK ROBOTS HAVE BECOME SUCH A PART OF OUR NATIONAL CONVERSATION RECENTLY? HAVEN'T PEOPLE ALWAYS BEEN AFRAID OF TECHNOLOGY'S IMPACT ON THE FUTURE OF THE WORKPLACE? SO DO YOU THINK FEAR OF TECHNOLOGY IS UNFOUNDED? SO THIS TIME THINGS REALLY ARE DIFFERENT? I’M SURE TAXI AND UBER DRIVERS ARE AMONG THEM. WHAT ABOUT A PROFESSION LIKE SALES? IT WOULD SEEM TO BE IMMUNE SINCE IT’S RELATIONSHIP-CENTRIC. YOU DON’T BELIEVE TECHNOLOGY WILL MAKE HUMANS IRRELEVANT AT WORK – WHY NOT? SO WHAT SKILLS WILL WE CONSIDER HIGH-VALUE IN THE FUTURE? IS IT POSSIBLE FOR WORKERS AND/OR BUSINESSES TO TRAIN FOR THESE SKILLS? DO YOU BELIEVE NEW JOBS WILL EMERGE AS LEGACY JOBS ARE AUTOMATED? YOU ASK, "IS IT A WOMAN'S WORLD?" IN CHAPTER 10. WHY? WHAT WOULD YOU TELL POLICYMAKERS IN WASHINGTON WHO KEEP PROMISING TO BRING BACK JOBS THAT SEEM TO BE DISAPPEARING TO TECHNOLOGY? Geoff Colvin is a top economic expert and popular speaker at major business meetings and conferences all over the world. His landmark bestseller, Talent is Overrated, remains one of the most popular-selling books in its class. In addition to being an in-demand keynote speaker, Geoff is also a gifted moderator and discussion-leader. WATCH GEOFF COLVIN SPEAK ABOUT HUMANS ARE UNDERRATED and the workplace of the future on YouTube. GIVE US YOUR FEEDBACK: Are you worried that technology will replace you at work? Do you worry that fewer interactions are with humans - like self-serve kiosks at McDonald's, for instance? Tell us what you think below.